* Please sir, kindly introduce yourself name and position in IPOB Igweocha zone. -------My name is Mazi Eze Ndu; I am the Coordinator of Igweocha zone 2 Obigbo. *So sir, what is going on today here in Igweocha with all these massive turn-ups of Biafrans? 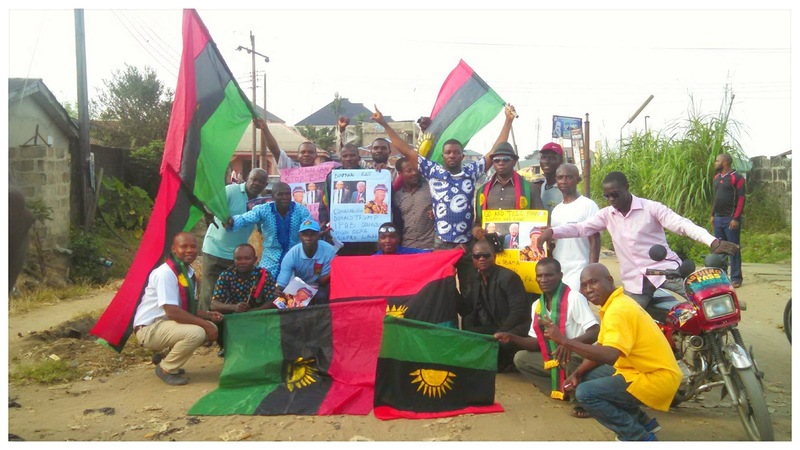 --------What we are doing today is that we are having a family union of Biafrans, and we are celebrating the emergence of Donald Trump as president-elect of United State of America because he fought against all odds. About the half of the money that Clinton put in their campaign Donald Trump spent about half of that, yet he became the president-elect. That tells us a lot. It is not all about money, it is about the truth. *What is the relationship between the state of Biafra and Donald Trump, and now a republican candidate has been elected president, what do we expect? ----------Actually, we Biafrans are republican even before there is Republican Party in America. Our people are republicans in nature. We have a good thing in common to share with America. We have almost the same culture. We believe in equal rights, we believe in God (Chukwu Okike Abiama). We are not terrorists. We value lives in Biafra like American do value lives. Therefore, what we are saying is that, the corporation between America and the state of Biafra will be mutual, since we have same sense of understanding. *Is the elected president Donald Trump going to share the same experience and work with Biafrans? -------Of course, we are very optimistic and we are looking forward to that because America is a free state. In Biafra, everybody is free. Therefore, we have a lot in common. I know Donald Trump hate terrorism, hate dictatorship. He is not a dictator. He (Trump) is a man that speaks out and wants people to speak out. He supports you when you are doing the right thing. Therefore, actually we are very optimistic that the corporation between the state of Biafra and United States will be mutual. *Muhammadu Buhari sent a message to the elected president (Donald Trump) that he is going to work with him to fight insurgency and terrorism. However, clips playing on Radio Biafra have it that Buhari is a terrorist sympathizer. So, what is your take on that? --------Well, the Republican Party in United States knows quite well how much Nigeria government spent to finance and support the democratic government of Hillary Clinton for her to win the election. The president-elect knows very well that the government in Nigeria led by Muhammadu Buhari never wanted him to emerge as the president of United States. Therefore, Buhari did all he has to do by extending the hand of fellowship by sending a congratulating message to United States. It now depends on the person that is receiving the message to act on what he said or not to act on what Buhari said. *The leader of Indigenous People of Biafra (IPOB), Citizen Nnamdi Kanu will be appearing in court come 17th November 2016. So, what is your take on the previous rulings and also on the fresh charges against him including treasonable felony, belonging to unlawful society etc? -------Everybody knows, and even God himself knows that Nnamdi Kanu did not commit any crime or any offense against the republic of Nigeria. 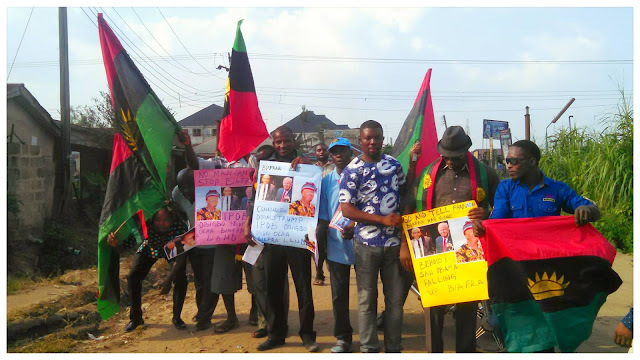 Biafra is a country that has been in existence before the emergence of Frederick Lugard who amalgamated the northern and the southern protectorate. Charging Nnamdi Kanu for treasonable felony is a conspiracy of the DSS and the executives to put him behind bars because they really know that for over a year now, they have not been able to come up with any tangible evidence which they will use to persecute the leader of Indigenous People of Biafra (IPOB). So, what they are really doing is by coming up with new charges. Trying to buy time to keep him in detention like Buhari already said that Mazi Nnamdi Kanu would not be released, that sends a signal that tells you that nobody will release Nnamdi Kanu just as president Buhari has said. But he forget one thing, that Nnamdi Kanu is there just because he put him there and his there, he is gathering momentum and it is now becoming advantage of indigenous people of Biafra(IPOB). What the president of Nigeria is doing is becoming a toll on the fresh. Keeping Nnamdi Kanu in detention is pulling the nation down. All he has to do if he can hear my advice, is to release Nnamdi Kanu, apologize to him, and let Biafrans go. Is as simple as that, because he can no longer hold back the restoration of Biafra. Biafra is the state that is much older than Nigeria. What we are trying to do, what Nnamdi Kanu is preaching, and what he is trying to do is to let the people of Biafra know that they want to re-establish the state of Biafra as it was before Nigeria was established. Therefore, putting him (Kanu) in illegal detention will not stop him. Today, putting him in detention has made millions of Nnamdi Kanu to emerge. The longer you detain him, more millions emerge. Therefore, please, i will appeal to the federal government of Nigeria to please as a matter of urgency, release Nnamdi Kanu and every member of IPOB detained in different secret prisons in the republic of Nigeria. ***Final question sir, what do you have to tell Biafrans out their? What is your encouragement words to Biafrans both those in Diaspora who are working very hard to make sure Biafra is restored? 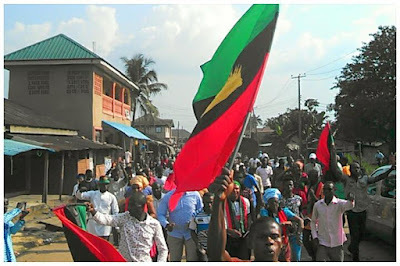 I ask all Biafrans to remain resolute, as you know there is a saying in Biafra land “That anywhere you go in the world and there is not a Biafran there, you better leave because the land is not good." That tells you we are everywhere in the world. And we are always resolute. I want Biafrans all over the world to remain resolute as I earlier said. Fight for your right. Fight for the restoration of Biafra. Biafrans in America, United Kingdom, Malaysian, India, Ivory Coast, I can only mention but a few. I urge you all too please remain resolute. Do not go back in your struggle for the restoration of your nation, because without Biafra you are nowhere. I also want to extend the hand of fellowship to the wonderful man of America, Donald Trump who came from zero platforms, entered into republican not a politician neither a military but with a different idea to liberate humanity on this planet earth. Kudos and cheers to Donald Trump. In addition, God bless Biafra and God bless United States of America. Keep on keeping on as our deputy Uche Mefor always say. 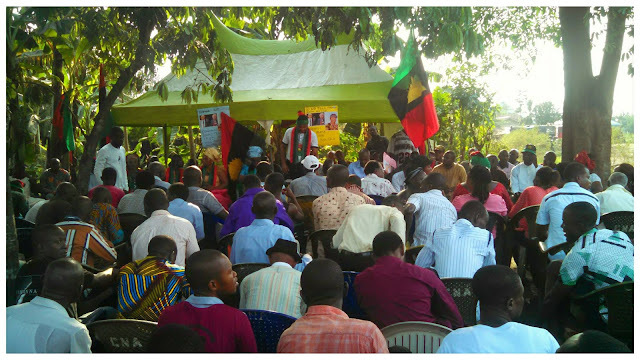 Celebration of IPOB here in Obigbo comprises of Obigbo zones, we have Obigbo central zones, Obigbo Market, Obigbo West and so many of them. In addition, with some many of their coordinators who are also present here to celebrate. *****Catch up the following events on Biafra Television that will be displaying the video clips and audio interviews.